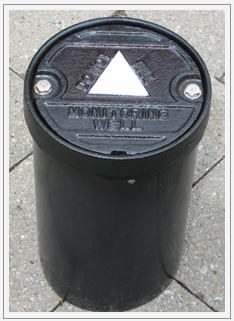 Complete line of Monitoring Well Manhole Covers – sizes 5” thru 12” diameter. Heavy duty cast iron covers and collars. Traffic rated design certified by an independent laboratory to meet or exceed H20 and AASHTO M306 roadway loading requirements. Quality construction with water tight covers utilizing Buna N rubber gaskets, stainless steel bolts, gasket washers, and embossable ID plates. Available in High Density Polyethylene (HDPE) or Galvanized sheet metal skirts. Plastic skirts are lightweight and economical, yet extremely durable. Can be field cut with only a hand saw. All items in stock. Same day or next day shipments available. Pick up orders welcome at our Green Brook, NJ manufacturing facility.